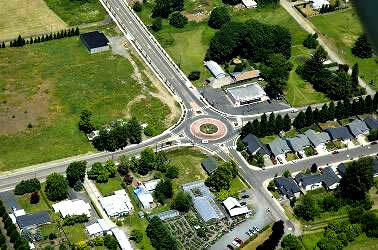 American traffic engineers and planners are using roundabouts with enthusiasm for several reasons. Roundabouts increase traveler safety, reduce travel delay, are economical, are beneficial to the environment, and improve the appearance of streets and intersections. Roundabouts are safer than any other at-grade intersection form because roundabouts have fewer conflict points, slower speeds, and easier decision making. Data from Europe, the United Kingdom, Australia, and the United States of America demonstrate improved safety over all other at-grade intersection forms in two distinct ways: 1) reductions in the total number of collisions, and 2) even greater reductions in injury producing collisions. Collision frequency and severity will decline for pedestrians, and motor vehicles. Pedestrian safety is also improved at roundabouts over traffic signals. 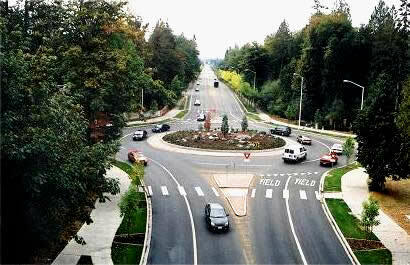 Pedestrians using roundabouts are able to cross a much smaller roadway, consider traffic traveling only one direction at a time, and are exposed to traffic that is traveling at much slower speeds. Pedestrian crashes at British intersections occurred at the following rates: 0.33 crashes per million trips at flared roundabouts, and 0.67 crashes per million trips at signalized intersections. (Roundabouts: An Informational Guide. Federal Highway Administration) Clearly, signals are inferior to roundabouts for pedestrian safety. Roundabouts typically carry about 30% more vehicles than similarly sized signalized intersections during peak flow conditions. Traffic signals can cause delay to side streets and left turning traffic from the major street. Increased capacity at roundabouts is due to the continuously flowing nature of “yield only until a gap is available” vs. stopping at a red light until my turn comes. Pedestrian travel distances will increase by about 20% at a roundabout over a traffic signal. Pedestrian delay at either type of intersection is difficult to predict and will depend upon random factors. Assuming no driver stops for a waiting pedestrian, finding a gap in traffic that is large enough to cross at a roundabout may take some time. This situation will only exist during moderate traffic volumes. At high volume periods where drivers are moving slowly, pedestrians will be able to cross as autos yield while waiting to approach the yield line. At low volume periods, acceptable gaps will be available frequently. At traffic signals, pedestrian wait time to receive a WALK signal may be up to 120 seconds depending upon at what point in the signal cycle the pedestrian pushes the pedestrian button. Pedestrians will be crossing traffic lanes for about 80 seconds. Roundabouts save money. 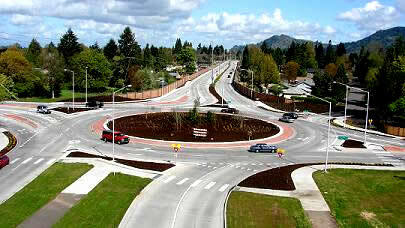 The City saves because operations and maintenance expense of roundabouts is less than that of traffic signals. Signal maintenance and electricity annual cost is $3,000 to $5,000. The driver saves time through reduced delay and lower fuel consumption. The community at large saves because collisions are less frequent and much less severe, reducing insurance cost, medical cost, and the human cost of injury and death. Roundabouts also reduce the need for added lanes along roadways because the capacity of a system is most often determined by the intersections. Roadways are widened from intersection to intersection to accommodate the queues generated by traffic signals. Roundabouts conserve land since road systems are narrower overall. A roundabout at Hayden Bridge Way/Parkway will need about 157,000 square feet of land and the traffic signal will need about 183,000 square feet of land, or about 17% more. Fuel consumption and air pollution are reduced significantly due to lower travel delay, especially in the off peak travel periods. Some areas of the country within Air Quality Containment areas are using Federal funds from the Congestion Mitigation and Air Quality Mitigation account to remove traffic signals and replace them with roundabouts to reduce both congestion and improve air quality. Roundabouts central and splitter islands provide area for landscaping, sculpture, or other aesthetic features. They also avoid the clutter of traffic signal controller boxes, poles and wires, and pavement cuts for detector loops.